In Hawaiian, mo'olelo most commonly means story. It comes from two words: moʻo, meaning a succession or genealogical line, and ʻōlelo, meaning to speak or give voice to. We all carry individual and collective mo'olelo – of our history, our hopes, our ways of seeing the world, our fears, our sense of belonging. The land we live on, what Hawaiians call ʻāina, meaning that which feeds us, carries moʻolelo as well. And when it comes to Hawaiian culture, mo'olelo is at the heart, making it a fundamental part of the Hawaiʻi Department of Education’s movement to transform learning for all – students, staff, families and community. To bring back a deep value and respect for mo'olelo and reclaim it as a foundational component of teaching and learning, to provide meaningful and embedded space for culture and community in the learning process, and to rethink how assessment looks, feels, and acts in our learning environments. Click play below to listen to the audio story, and how learning is changing for young people and educators across the islands of Hawai'i through this work. 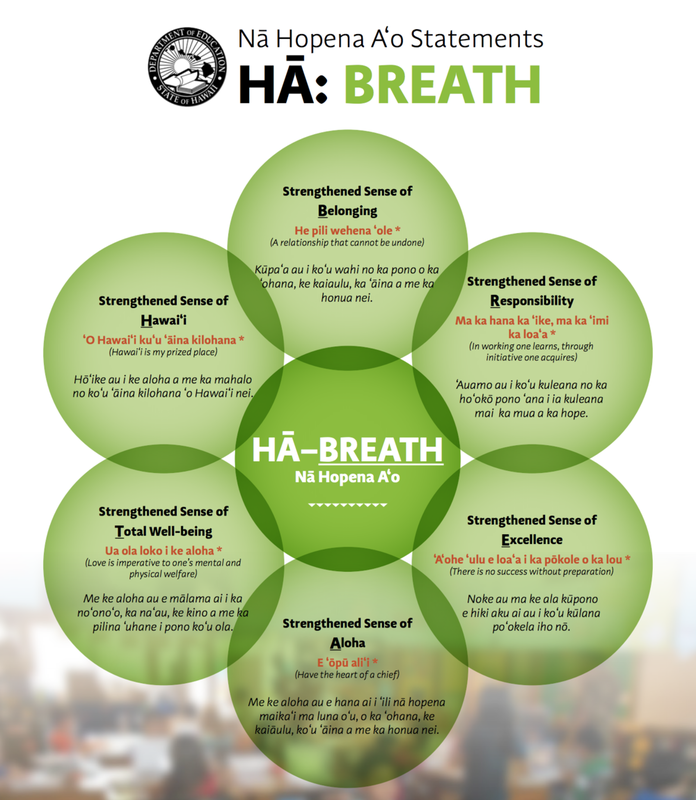 Nā Hopena Aʻo, also called HA, is the framework which is shaping this journey. To explore how the community created HA, visit here. "What makes Hawai'i, a place unlike anywhere else, are the unique values and qualities of the indigenous language and culture. ‘O Hawai‘i ke kahua o ka ho‘ona‘auao. Hawai'i is the foundation of our learning." "Considering the diversity of the student population in Hawai’i, Nā Hopena Aʻo gives them the ability to see themselves in a path to success."